Okay, so perhaps you might be wondering about the title? Well, the Seattle Seahawks play tomorrow and I thought hey, I posted a photo in honor of the 12th man, might as well post another photo of Seattle prior to tomorrow’s game! Anyway, here’s a shot that isn’t normally “taken” of Seattle. 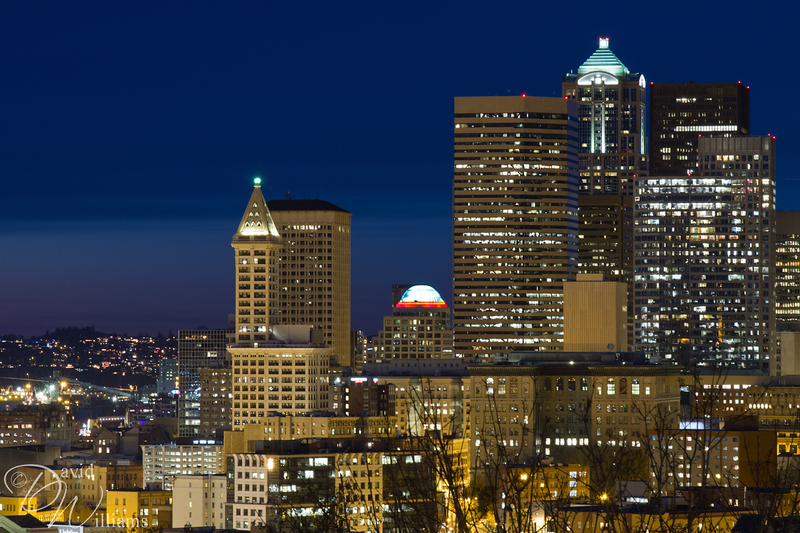 I was intrigued by how the skyline tapers off for some reason….hmmm, enjoy! Great shot, David! I love the sharpness of this, the composition, and the colors are beautiful. I’ve been enjoying the desert and the mountains these past few months but I am definitely in need of a city “fix” right about now. I love your Seattle skylines! Thank you, I had ton’s o fun in Seattle, can’t wait to head back! Perhaps this time, I will get some “street” photography in…something I have never really done before! As always, thank you very much for the comment. It has been a while since I last saw Seattle in this view. Beautiful shot David! Thank you Emily, I tried to go for a different PoV of Seattle! Thank you Mike! I really had a good time down there. Lovely skyline shot at the magic hour. I do like the way the skyline tapers off. Thank you Sasi, it’s not your typical Seattle skyline shot but, I like it!